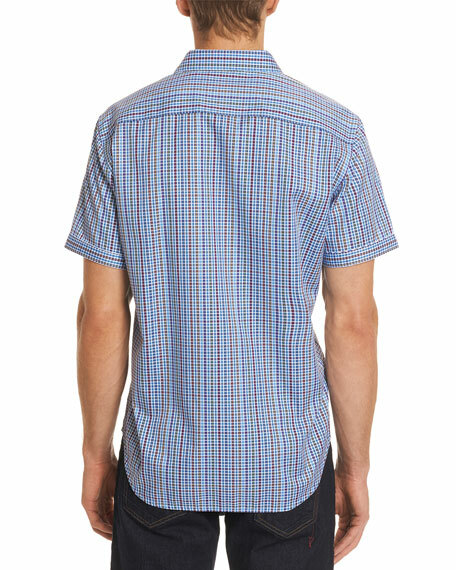 Robert Graham "Palma" sport shirt in multicolor gingham. Ermenegildo Zegna shirt in small-check. Spread collar; button front. Rounded barrel cuffs. Yoked back shoulders. Shirttail hem. Cotton. Imported. Model's measurements: Height, 6'1"/185cm, waist 30"/76cm, suit 38R, shirt 14.5x34, inseam 34"/86cm. Robert Graham "Villa Clara" sport shirt in floral print. Spread collar; French-placket button front. Mitered barrel cuffs; contrast reverse. Yoked back shoulders. Signature "Knowledge Wisdom Truth" embroidery at shirttail hem. Classic fit. Cotton; machine wash. Imported of Italian material. 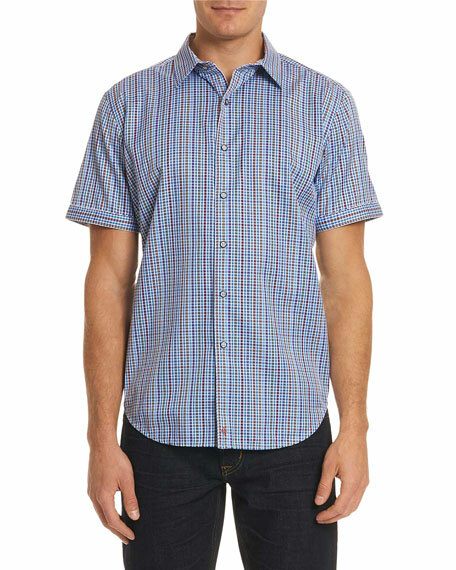 Robert Graham "Gills" sport shirt with graphic print trim. Spread collar and button front with contrast-print facing. Short sleeves; contrast-print piping. Yoked back shoulders. Signature "Knowledge Wisdom Truth" embroidery at shirttail hem. Classic fit. Linen. Machine wash. Imported. Model's measurements: Height 6'1"/185cm, waist 32"/81cm, typically wears size M.